QSB graduate student Kinsey Brock and undergraduate researcher Indiana Madden made the first documented discovery of cannibalism in a subspecies of wall lizard on the Greek island of Siros. Video courtesy of Indiana Madden. This grisly description isn’t from a horror story. Nor is it a macabre vignette from Greek mythology. It’s from a scientific paper authored by Kinsey Brock — Quantitative Systems Biology doctoral student and two-time Southern California Edison Fellowship recipient — and her undergraduate field assistant Indiana Madden. 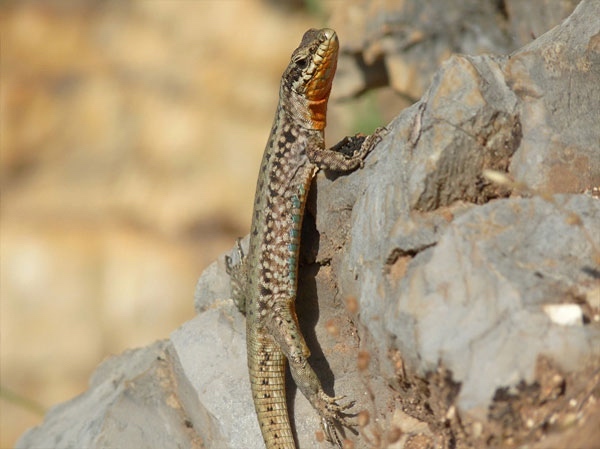 They recently published a paper in Herpetology Notes reporting their discovery of lizard cannibalism in a subspecies of Aegean wall lizard, Podarcis erhardii mykonensism, native to the island of Siros. Luckily, the lizard stuck around long enough for Madden to document her discovery. The Aegean wall lizard Podarcis erhardii. 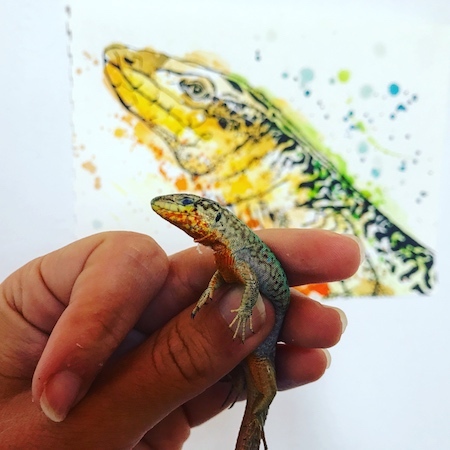 Photo and lizard drawing by Kinsey Brock. Brock and Madden weren’t looking for cannibal lizards. The pair were island-hopping in the Aegean — in the name of science, not leisure. It’s one of the perks of working for Professor Dan Edwards, who studies how the environment affects the evolution of reptile appearance and behavior. And it just so happens that Aegean islands provide scientists with natural laboratories for lizard evolution. During the last ice age, which ended some 12,000 years ago, the Aegean islands and Greek mainland were a single contiguous landmass. The Aegean wall lizard, unconstrained by maritime barriers, dispersed across the entire region. But the ice age ended, ice melted and sea levels rose. Valleys were deluged and highlands were transformed into islands — today’s Aegean archipelago. Lizard populations that used to interbreed were suddenly marooned. As time passed and each island developed its own ecosystem, the lizards were forced to evolve or perish. Today, scientists like Brock and Madden visit the archipelago to understand how evolution produced so many unique adaptations. Brock said each wall lizard population adapted to its island home differently. On islands with no predators, lizards are larger, look similar to one another and have simple diets. They also behave more aggressively and have stronger bite forces. On islands with diverse vegetation, diets are more diverse and there’s more variability in color, pattern and body size within lizard populations. And now, with their new discovery, cannibalism can be counted among the lizard’s adaptive strategies, at least on Siros. The Aegean wall lizard Podarcis erhardii. Photo courtesy of Kinsey Brock. “We’re just starting to understand these patterns of evolution in this system,” Brock said. She hopes studying lizard evolution can also help answer more fundamental questions about biology. “A big, open question in evolutionary biology is ‘how predictable is evolution?’” Brock said. And that’s not the only lingering mystery. Brock and Madden are still trying to figure out why cannibalism emerged on Siros. Cannibalism is particularly beneficial when food is rare, but the lizards of Siros don’t suffer resource deficits. Brock and Madden have an inkling as to why the lizards of Siros took to cannibalism. “What’s interesting about this case is that there were plenty of insects — the primary food of P. erhardii — around where we found the cannibal. Yet an extreme case of adult-on-adult cannibalism occurred,” Madden said. “It sounds morbid to us, but if you’re a male lizard whose instinct is to control as much territory, get big and strong, and mate — as much as possible — then it makes sense why an animal would consume another competitor.